How to slow down battery sulphation - Shenzhen Daceen Technology Co., Ltd.
How to slow down battery sulphation? There are many ways to slow down battery sulfation depend on you use and maintenance properly everyday. Improperly charge and discharge is the major reason of battery early failure. Thus, the first important way is not to keep a lead-acid battery over-charged and deep discharged frequently. Based on the battery type, use an better charger in a well ventilated place that is able to deliver a continuous, temperature compensated "float" charge at the battery before it being fully charged. If over-charged (2V cell charging volt higher than 2,275V, 12V cell charging volt higher than 13,6V), the cell's electrolyte will loss H2O very fast which raise gravity of acid resulting in sulfation heavier and plates corrosion. Don't keep the battery in a wrong charging current value, use the right charger at the battery manufacturer's recommended float or maintenance voltage for a fully charged battery. The best charging current value is 0.1C(e.g. 1 cell capacity is 100Ah, C=100A, the charging Current value =0.1C, 10A), the Max Recommended Value is less than 0.3C. If cell charged at high charging rate, the cell voltage will reach a high value, resulting in over charge and H2O separation. H2O separating, no overcharged , temperature compensated. 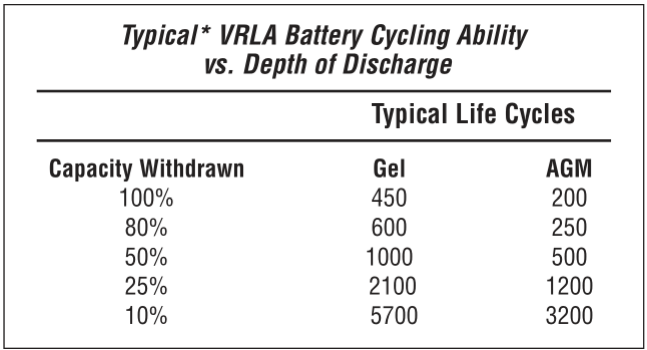 Does depth of discharge affect cycle life and battery lifespan? 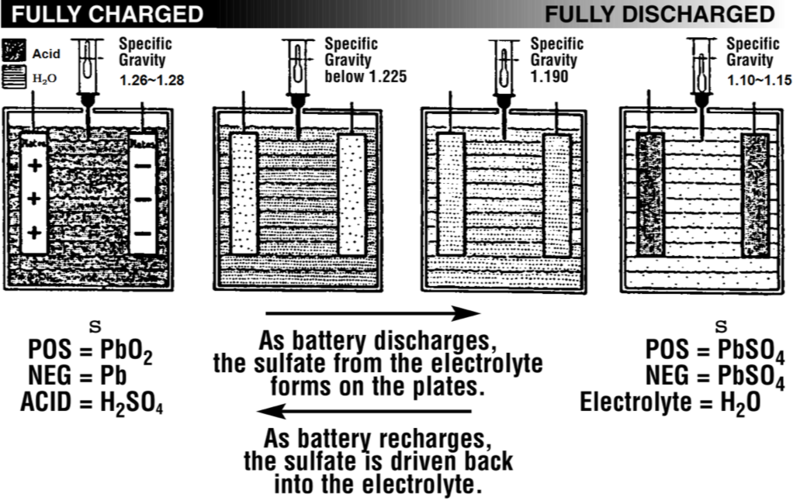 Even a partial or deep discharge will cause sulfation on the plates that reduces battery capacity and leads to premature battery failure. Periodically check the battery OCV and charge when necessary. Do not leave batteries deep discharged! Damage battery occur in a very short period. Recharge batteries if needed, Charge whenever the battery OCV is: Wet/flooded: 12.5 or less; AGM: 12.7 or less. 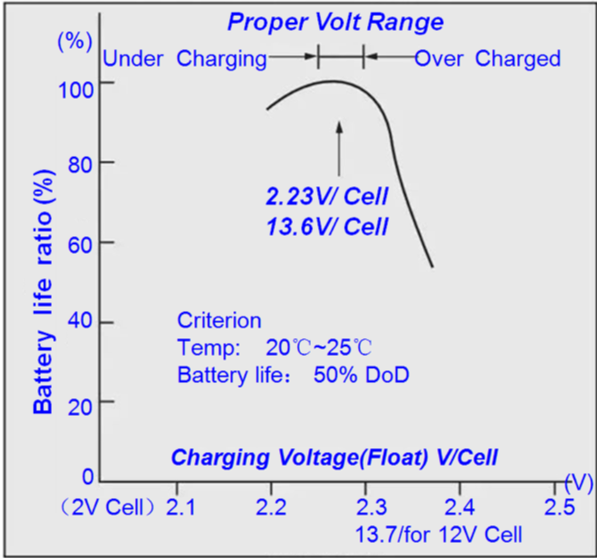 If the cell volt is 2V: 2.05 V or less need recharge. It is better to use a pulse charger or maintainer to periodically recharge (or "top off") the battery when the SOC drops to 80% or below. Maintaining a high SOC tends to prevent irreversible sulfation. The frequency of recharging depends on the parasitic load, temperature, battery's health, and battery type ,etc. But the battery used as traction power or energy storage, it unavoidably deep discharged occurs. We should pay more attention to maintain batteries, Such as pulse charge and replenish water in time, stored in proper temperature and periodically desulphated by our smart pulse restore system. 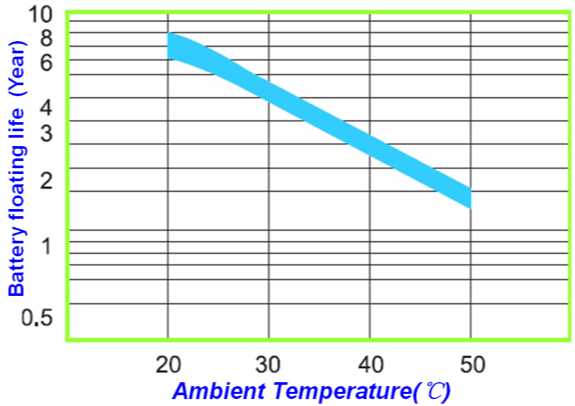 temperature, rest periods, type of equipment, age of battery, etc. Don't leave a battery at a low stage of charge for an extended length of time. Charge a discharged battery as soon as possible. Don't cycle a battery at a low state of charge without regularly recharging fully. Use the highest initial charging current available while staying within the proper temperature-compensated voltage range. 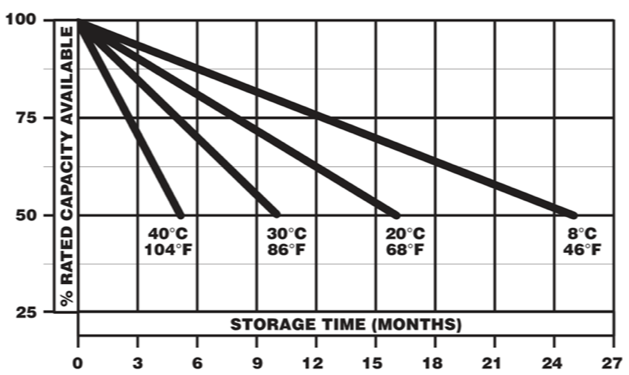 Temperature is a major factor in battery performance, shelf life, charging and voltage control. At higher temperatures there is dramatically more chemical activity inside a battery than at lower temperatures. The following charts graphically illustrate this fact. If you decide to periodically recharge the batteries while in storage, increasing recharge frequency, disconnecting any parasitic load, or storing them in colder temperatures will impede the self-discharge and reduce the possibility for permanent sulfation, but will also reduce the total number of life cycles. Now as we all know that all lead acid batteries especially Flooded type, with a used time increasing and after many times of repeated charge-discharge cycle , electrolyte decline due to water loss when charging, being charged, thermal runaway or heated evaporation, etc., which needs to be replenished in time. Usually check the electrolyte level of the battery once a week, if it is in summer or high ambient Temp,. you should check it 3days per week. Good specific gravity value is 1.28 after cell fully charged. Distilled water or deionized water is necessary, Never use tap water or river water because it contains ions metal. It could be seen from left cycle chart: PbSO4 and H2O are formed in the process of discharge, If the H2O is lost during charging, PbSO4 can`t be completely converted into PbO2 and Pb. Thus, battery sulphation is starting, if you don`t add H2O timely to optimize cell electrolyte, PbSO4 ● 5H2O become harder and larger crystals leading to battery failed. Replenishing water is more important task for all Flooded cells than any other types of batteries.